One of the things I like most about music festivals is how easy it is to discover something new that you love. Amid all the hustle and bustle, sometimes it's those bands playing on the side stages that really surprise you. This blog was originally published on nodepression.com. A North Carolina-based six-piece that brings high-energy horn rock to the stage, Holy Ghost Tent Revival is one of the bands I had the pleasure of seeing for the first time at this year’s Wakarusa. The mid-evening performance was bursting with excitement and sound — the band’s instrumentation includes both a trumpet and a trombone. 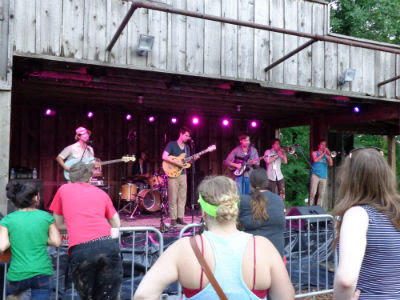 The players were amped and put on a great show for the crowd at the Backwoods Stage, with songs that reminded me of going to church on Sunday morning. I thoroughly enjoyed what I heard from the group during the show, and had the opportunity to speak with one of the members, Stephen Murray, after the set. Alright. If you can just introduce yourself and your bandmates and tell me instruments you play and that kind of thing. Yea. My name’s Stephen Murray. I play the Rickenbacker guitar and I sing, mainly. We have Matt Martin to my right on a lead guitar and backup vocal. We’ve got Kevin Williams on bass guitar and lead vocal. Ross Montsinger holds us down on drumset. Then we have Hank Widmer on trombone and Charlie Humphrey on trumpet. Okay. How did you guys find each other? What brought you together? Might as well. And how long has that been? Tell me a little bit about where the name came from. Holy Ghost Tent Revival is very catchy, you know. Not something you hear all the time. Yea, it fits. It fits the— I think in a way it maybe subconsciously influenced the gospel energetic take we have with songs. It certainly wasn’t a conscious choice to be like, “Well, if we’re going to call ourselves this, then let’s write songs that sound gospel or upbeat or anything. But I think it’s influenced us. Okay, so, going a little bit more in depth on your style, how would you describe that? It started off very Dixieland and ragtime, and right now we’re so much into the ‘60s and ‘70s, like horn-rock, The Band and The Stones and The Beatles, kind of just like really groovy. R&B is starting to be a huge influence on us now, with the newer tunes. So yea, I tell people we’re a ‘60s rock band with horns. And you mentioned something about the gospel, high energy type of music you guys are playing. How do you keep that energy going while you’re touring and doing shows? Really, all day long we just veg out. We’re not— Sometimes we’ll throw the frisbee. I think that’s the only key to it. We have a really big van now, so we tend to sleep a lot. So it’s only — in the scheme of things — it’s only like an hour or an hour-and-a-half that you have to play. It’s easy to bottle that up and kind of explode. But, you know, there’s certain— Right now, at the level that we’re at— Like the past three shows there was less than 10 people there so you don’t have to go balls out, you just kind of play your tunes and people appreciate that much better than if you were to rock out in front of 10 of them; it would be a little confusing. Do you guys have any projects, albums coming out, anything like that? We recorded an album in 2010 and never did anything with it and we just released that … because our local fanbase — like North Carolina, South [Carolina], that whole kind of few states there — we have a really strong following, and we never released that, and that has two members that used to be in the band, so that’s a really big deal in our local setting. And then we’re recording a record with Bill Moriarti in Philly … which will be kind of what you heard tonight, that style. The album we just released, I’m playing banjo the whole time and it’s nothing like we sound now. Any things coming up in the future that you’d like to talk about, besides this album? Any changes or anything like that happening? Our trumpet player just graduated college, so he’s gonna be full time. And whenever we play regionally, we have two girls that sing backup. We call them Dulci and The Devil. That’s more of a local pull though, because we can’t afford to take them on tour. But, that’s exciting. That’s pretty much it. We’re just focused on this record. Man, it’s just like, we saved up thousands of dollars to do this recording and it’s just gonna hurt so much to finish the recording and then have to raise another thousands of dollars to just release it, you know. So we’re really hoping somebody ... will help with distribution. Good luck to these guys as they work on getting the new record out and moving forward to bigger things. HGTR will be making its way from the East to West Coast for the first time over the next few weeks, so stop in for some of that gold ol’ revival spirit. Check the band’s website or Facebook for tour dates and locations. Twitter, or YouTube. Read more about Thandiwe here.